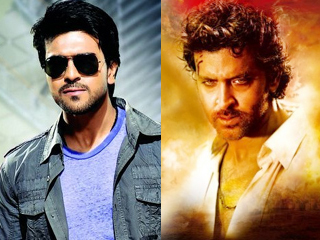 Ram Charan to Remake Hrithik Roshan's Agneepath? If the buzz in the film nagar circles is to be believed, Tollywood filmmakers are planning to remake Bollywood film "Agneepath" starring Hrithik Roshan and Priyanka Chopra. We hear that there are few filmmakers who are eyeing the Telugu remake of "Agneepath" and are planning with a big cast. Reports say that directors are working on the economics of the project since the film needs star cast and high budget. With the recent success of "Gabbar Singh", the Telugu remake of Bollywoodâ€™s "Dabangg", the makers presume that this is the right time to produce remakes. Also, with Ram Charan working on "Zanjeer", the winds are strongly blowing towards remakes. "Zanjeer" is a remake of Amitabh Bachchan's yesteryear film while "Agneepath" is the remake of 1990 Bollywood crime film directed by Mukul Anand. Though the main lead of the film is not decided we hear that the makers are having Ram Charan in mind for this remake.